Conceptual photographer Tyler Grace’s first major exhibition, The Chronic Diaries, is a blend of gothic romance and classic surrealism, his sombre images charged with facets of narrative that draw viewers into a contorted, anxious world. Grace’s evocative talent drew on influences from the landscape surrounding his home in Albury/Wodonga, as well as his living with a number of chronic illnesses, to create this series of nineteen prints. Standing in front of one of Grace’s photographs summons the bleak theatrical presence of playwright Samuel Beckett, such are the figures seemingly held in the unrelenting grip of absurd life. Visitors to the HPG Festival Hub on Euston Rd during the 2017 Fringe Festival were able to catch sight of Grace’s arresting imagery while waiting to see ticketed performances. Though still, the exhibition commanded a lot of attention in this vast space, echoing the physicality and heightened reality of the live shows flashing and echoing around its fixed solidity over the course of the entire festival. 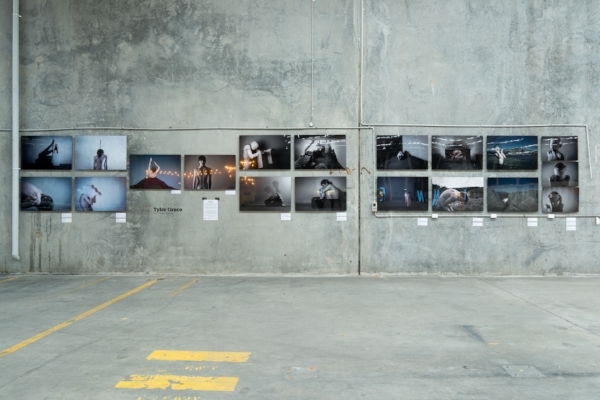 “The concrete walls complemented the dark and gritty feel of a lot of my images,” says Grace. Elements of the warehouse’s piping incidentally framed part of his exhibition, extending the theme of a body held in thrall by the world around it. At 24, Grace has only had the opportunity to visit Sydney a couple of times, with the Fringe marking his most recent trip. As an artist living with chronic illnesses, the journey took a toll on his body, and it can be easy to forget the abled privilege of working long days and running around for sustained periods to bring any Fringe project into being. Grace writes extensively about his experiences on his blog, and in one account talks openly about how there are days where he will have to cancel photoshoots because of severe “brain fog”, when his nerves are not communicating properly throughout his body. For Grace the intention of his work in The Chronic Diaries is to communicate his experiences of chronic illness, to illustrate for those without such illnesses a sketch of his daily life and to provide others living with chronic illness a wave of solidarity. His skill in composing, capturing and editing images that achieved this communication was met with great popular attention during the Fringe, and The Chronic Diaries won a Critics’ Pick Fringe Festival Award. Had Grace had the opportunity to be in Sydney for longer, he would’ve enjoyed spending more time at the Euston Road space so as to meet with audiences and discuss his work with them. Interest in Grace’s dramatic photography has grown significantly since his time at the Fringe. The Chronic Diaries will be touring to exhibit in Orlando, USA, and then onto the ImageNation Paris International Photo Expo after that. Recognition for Grace’s art has also seen him awarded the WAW Photography Award at the Chiltern Art Prize this year, and he will be exhibiting a new series at the Culture Center in Cape Cod, USA in November.